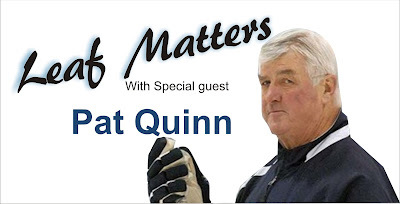 A couple of weeks ago, I wrote a piece about former Maple Leaf coach Pat Quinn. Though the Leafs fared very well under Quinn as coach (and for four seasons, as General Manager as well)—though never completing the mission of winning the Stanley Cup—he was constantly criticized by certain media folks and by many fans as well. The criticisms? He relied on veterans too much. He didn't play the kids enough. He didn't play Sundin enough. His teams didn’t win a Cup, despite having so much money to spend. The claim was that he never found a winger for Sundin (not really true, given that we brought in Mogilny and Gary Roberts, for example). He supposedly traded away too many “futures”—though I’m still waiting to hear exactly who he traded away (Boyes—nice player but c’mon, he’s been with five teams…) that wasn’t worth the risk at the time to try and win a Cup by acquiring solid veterans for those stretch runs. So I find it kind of revealing to witness so many Leaf fans (and mainstream media types) applaud Brian Burke’s “great job” in his now four plus years as GM in Toronto. Quinn also took over an under-performing squad- and made it elite year after year. Burke has done many good things, too, but Quinn was hammered for not doing even more, when the bar for Burke has clearly been set much, much lower. That is further evidenced by the fact that many Toronto fans also say Burke is doing a solid job and deserves even more time to build a winner- despite missing the playoffs every year since he has been here. There is no question Burke took over an impoverished Leaf roster when he came on board in November of 2008. But looking back, the fact is, the team Quinn took over before he became coach in the 1998-’99 season was not a good one, either. It had not won a playoff series in years, and in fact, in the previous two seasons under Mike Murphy, had missed the playoffs completely. Not to knock Murphy—he had been a fine NHL’er and represented the organization very well as coach—but Quinn, (albeit with better goaltending, which always helps) immediately injected the team with confidence and a willingness to play more wide-open hockey. With three rookie defensemen on the blueline (I guess he didn't realize he didn't like young players, as his detractors often suggested), the Leafs made the “final four” in Quinn’s first season behind the bench. As a GM, Quinn never had the luxury of drafting high—not even close to the top ten, as I recall. Yet he and his scouting staff were able to select a number of players who have gone on to be useful NHL’ers, including Carlo Colaiacovo, Alex Steen, Jay Harrison, Karel Pilar (until heart issues ended his NHL career) along with Matt Stajan, Ian White and Staffan Kronwall. He also made one of the best Leaf trades in recent memory, when he dealt Alexander Karpotsev, a fine player but at the end of his NHL career, to acquire Bryan McCabe—a talented under-achiever for several other teams who became an end-of-season All-Star with the Leafs. The often-maligned McCabe, under Quinn, was good enough to be selected, if I remember correctly, for Team Canada's 2004 World Cup squad. And there is no question Tomas Kaberle, the sometimes infuriating defenseman, played the best hockey of his solid NHL career under Quinn. His NHL coaching career aside, I believe (despite no “Cups”, the only blemish on his resume, though he went to the finals twice) those accomplishments alone should make him Hall-of-Fame worthy. Again, what other coach in history has done that? While I knew he had been part of Hockey Canada’s international teams many times, I did not know, until Matteo Codispoti (We Want a Cup) and I spoke with him for Episode 10 of our Leaf Matters podcast that Quinn has actually been, if I heard correctly during our chat, part of ten different Hockey Canada/Team Canada efforts as either a Coach, or GM/assistant. And on eight occasions, Canada won a medal. That’s a startlingly good record, by any measure. I’m well aware not everyone was a huge Quinn fan in his time here, but I also know that he is widely respected and held in the highest regard by so many in the hockey community. And perhaps even more importantly, he is immensely popular with fans wherever he goes. I’ve heard story after story (though never from him) of people who have approached him for photos and autographs or simply to talk, and he has always responded genuinely—and generously - with his time. He is one of those individuals that represents so much about what is good in the world of hockey. He has been a player (over 600 NHL games, I think it was, before an off-ice injury ended his career prematurely), a team captain, a player rep and has been a coach, GM and team president, representing the Vancouver Canucks at the Board of Governors as well. He has been involved in virtually every facet of the game, and the list of executives that he hired (giving them their first hockey job), like Brian Burke, who have gone on to great success is very, very long. For me, he is very much a symbol of what being a “Maple Leaf”, in the tradition of Conn Smythe, is all about. Podcast # 10 is a 10 !! Really enjoyed listening in on your chat with Pat. What a pleasure! It's great that you have such a wealth of experiences with our Leafs and such a great ongoing rapport that you are able to draw upon those treasures for our enjoyment. Always liked Pat, and now feel like I know him a bit better - thanks for that! Thanks for taking the time to listen in, InTimeFor62. Hopefully it was an enjoyable conversation for other Leaf and hockey fans as well.